Forensic teams at the scene. GARDAÍ HAVE ISSUED an appeal this afternoon as its investigation gets under way into the fatal shooting of John Lawless in north Dublin in the early hours this morning. The 39-year-old was shot as he walked from his home along Marigold Crescent in Darndale on his way to work. He was critically injured, and brought to Beaumont Hospital where he was pronounced dead. Shortly afterwards, a silver Ford Focus with a 132-D registration was found partially burnt out at Greenwood Avenue off Blunden Drive in Coolock. It’s believed the car was used in the shooting and was stolen following a burglary in the Santry area on New Years’ Day. Both scenes have been examined by the Garda Technical Bureau. Lawless’ body has been removed to the Dublin city mortuary where a post mortem will take place. 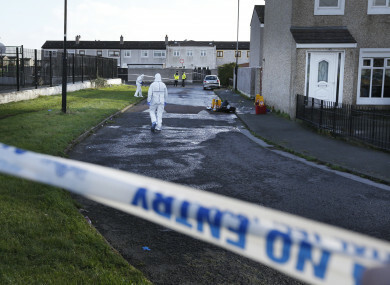 Gardaí have yet to establish a motive for the crime, but there is nothing to suggest at this time it has a connection with gangland crime or any major feud. The victim is not known to gardaí for being involved in any serious criminal activity. Anyone who may have witnessed the shooting at Marigold Crescent. Anyone who may have observed the silver Ford Focus prior to the shooting. Anyone who saw the car after the shooting traveling from the Darndale area across Malahide Road towards Blunden Drive and Greenwood Avenue. Any motorist who may have travelled the areas mentioned with dashcam footage. Donnelly said it was a busy time of morning for commuters in the aftermath of the shooting and urged those with information to come forward. Anyone with information is urged to call Coolock Garda Station on 01 666 4200, the Garda Confidential Line on 1800 666 111, or any garda station. Email “Victim of fatal Darndale shooting named as 39-year-old John Lawless”. Feedback on “Victim of fatal Darndale shooting named as 39-year-old John Lawless”.